A year ago on Monday marked my 10k anniversary. 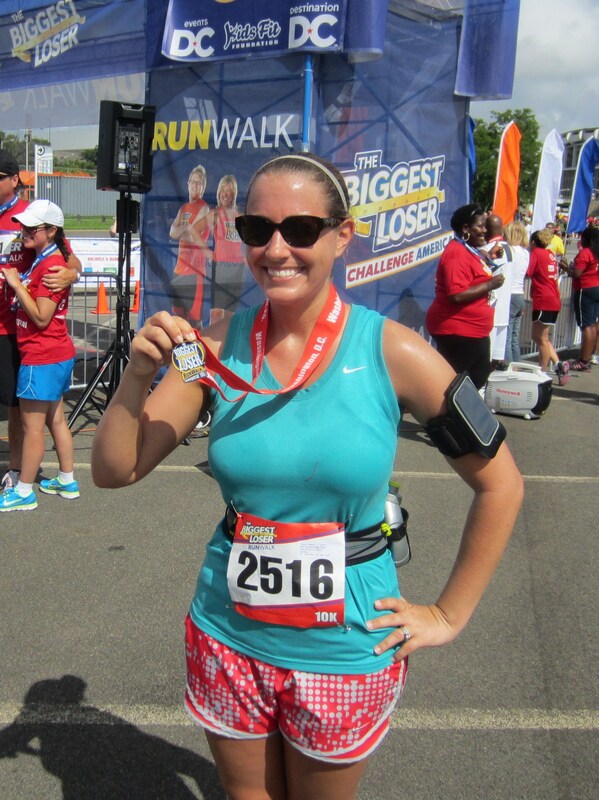 On July 14, 2013 I ran my first 10k, the Biggest Loser 10k, here in DC. It was the first time that I ran a race of a distance further than a 5k. Its hard to believe just how far I’ve come in the past year! Since then, I’ve completed three additional 10ks, as well as a ten miler and two half marathons. My next 10k won’t be until September when I run the Dulles Day 10k on the Runway (you can check out my recap of the 5k from last year here). Since I powerwalked my last 10k in January, and haven’t run a 10k race since October, I’m very interested to see how much I can improve my finish time by, especially since the Dulles Day 10k course is on the airport runway at Dulles Airport and will be super flat. Here’s to many more 10ks in the future, as well as other long distance races! QOTD: What milestone race did you run a year ago? This entry was posted in Milestones and tagged 10K, Biggest Loser 10K, first 10K, milestone, running. Bookmark the permalink. 16 Responses to A Year Ago I Ran My First 10k! You have made great strides girl! That dulles course sound interesting. Is it an old runway they use? Last year the course was on a backup runway, but they’re advertising that it’ll be on a different runway this year. I’m eager to find out! Oh, I was looking for a race in September and thinking about the Dulles one. I’m going to go check out your review 🙂 It’s amazing how far you’ve come in a year! This time last year I think I had just started running in order to try to prepare for a color run 5k in September. Register for Dulles Day, you’ll love it! There’s nothing quite like running on a runway along side those huge planes! The airport runway? That sounds kinda cool! I just ran my first 10k this year. I loved the distance; not too long, not too short! Happy anniversary! It was an incredible experience last year, and I can’t wait to do it again this year! A year ago I ran my first (and maybe last) Mud Hero run. I was 6 months postpartum…it was a blast but I focused on nursing my little one and not hyrdating/eating for me. It was a bad combo in the end. Yikes! But it sounds like you’ve learned more about what’s best, or not best, for your body, which is super important. It’s so fun to look back a year ago! I ran my first 10k last year, too. I had run a half the year before but never a 10k. I still think it’s my favorite distance! I love that a 10k allows you to push yourself just a bit harder than a 5k, but it doesn’t require as much training as longer distances. Happy runniversary! I haven’t been running for a year so I can’t say the same, but 7 months ago I completed my first 5k and it is an awesome feeling! Congrats on your accomplishments!! Crossing the finish line of any race distance for the first time is such an awesome feeling! Seems like you have been running forever now! I will have to check out your Dulles Runway recap, I remember it was on a list of races you recommend so I am excited about it! Some days it does seem that way, and other days it still feels like I’m just starting out, haha!